So busy. In fact, right now and for the past couple of weeks buying back college-related books – textbooks. And getting them packed up and shipped out for the next day. And on top of that helping customers, SPS (sorting, pricing, shelving) new arrivals, keeping the floor swept, filling in holes on the shelves, straightening shelves, and trying, really trying to keep the store tidy. If you’ve been in lately you know the last item hasn’t been happening. But not for trying! The Middlebury Arts Walk was several weeks ago with the theme of Children. 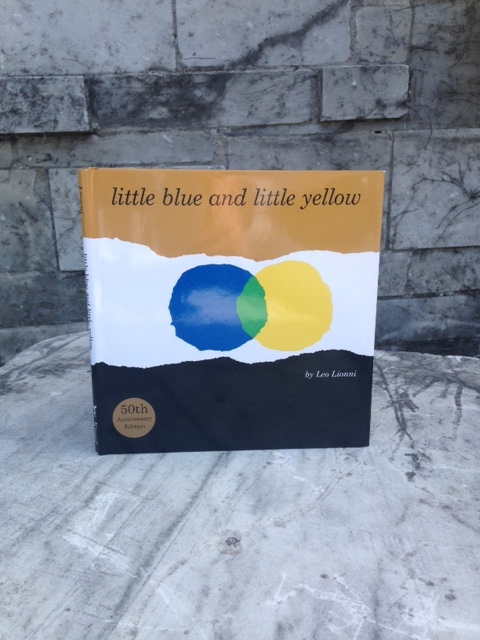 I chose the book “Little Blue and Little Yellow,” by Leo Lionni, for a StoryWalk. The path of pages led from Printers Alley through the historic Marble Works with the last page at the store’s door. Upon reading the book, children were given a bag of their own Little Blue and Little Yellow, made from homemade playdough (that I and my grandson, Greyson made) to create their own story of the pair. It is a great story about friendships as well as color. And the book sold that night. The pages were photocopied and laminated to preserve the book. I’m excited about June’s Arts Walk. I’ll be featuring the work from White Dragon Paper. The artist, R. Lawton, hails from Ohio. She is a papermaker as well as a book binder. I’ll tell more about her and show images of her work as the time gets closer. I love handmade paper and I love books!